Die Unterkunft ist für eine größere Gruppe sehr gut geeignet. Leider sehr kalt und die Lüftungsgerät zu laut um zu schlafen. Where to find Friedrichshafen hotels near an airport? Where can I find hotels in Friedrichshafen that are near tourist attractions? Are you after a convenient hotel or apartment while staying in Friedrichshafen? There are 17 hotels and apartments within a 0.1-kilometre (0.06-mile) radius of the center of Friedrichshafen which are part of Expedia's extensive network. 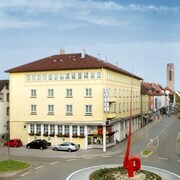 The SEEhotel Friedrichshafen and Hotel City Krone are some of the more centrally located lodgings in Friedrichshafen. If you are seeking budget accommodation options, try the Comfort Hotel Friedrichshafen, Hacienda Hotel and Central Hotel Friedrichshafen. 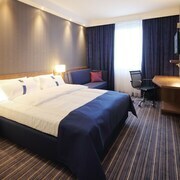 12 kilometres (7 miles) away from the heart of Friedrichshafen, is the Burgunderhof Hotel - Adults Only. The Hotel Bad Schachen is situated 17 kilometres (11 miles) away. 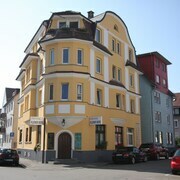 Two more options are the Hotel Weisses Kreuz and the Hotel Säntispark. Looking for more to do? Consider spending a day or two discovering Mainau Island and Sealife Constance, in Constance, 25 kilometres (14 miles) to the west of Friedrichshafen. 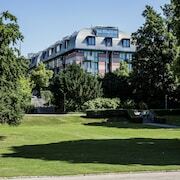 Should you wish to spend a night or two in Constance, check Expedia's booking pages for the latest deals at the Steigenberger Inselhotel and ZIIL Hotel. 16 kilometres (10 miles) to the west of Friedrichshafen, you can also stay at Meersburg, which is home to the Romantik Hotel Residenz am See and JUFA Hotel Meersburg. The Old Castle and Meersburg New Palace are just a couple of the more popular attractions to explore while in Meersburg. Consider spending a few hours cheering along with local sports enthusiasts at a local sporting fixture. You'll find Erdinger Arena 65 kilometres (41 miles) to the southeast of Friedrichshafen. Sleep nearby to the action at the Hotel Oberstdorf or the Parkhotel Frank. Friedrichshafen - Lake Constance Airport is located 4 kilometres (3 miles) from Friedrichshafen. Travelers who wish to stay close by, can easily secure a room via Expedia at the Top Budget Hotel Sieben Schwaben or the Best Western Hotel Goldenes Rad. 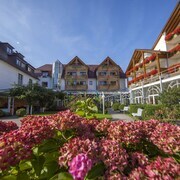 What are the most popular Friedrichshafen hotels? Are there hotels in other cities near Friedrichshafen? What other types of accommodations are available in Friedrichshafen? Explore Friedrichshafen with Expedia.ca’s Travel Guides to find the best flights, cars, holiday packages and more!